HEAT oven to 375°F. Coat 13 x 9-inch baking pan with no-stick cooking spray. Combine cookie mix, oats, butter and egg in large bowl. Press lightly into prepared pan. Bake 17 to 19 minutes or just until edges begin to brown. Remove from oven. Cool completely on wire rack. WHISK orange gelatin and water in large bowl for 2 minutes. Beat in cream cheese on low speed with electric mixer until blended. Reserve 3 tablespoons frosting for topping. Whisk remaining frosting into orange filling until smooth. Chill 30 minutes. BEAT heavy cream and 3 tablespoons frosting in large bowl until stiff peaks form. Chill. Stir chilled orange filling. Pour over cookie crust. Chill 1 hour or until filling has hardened. 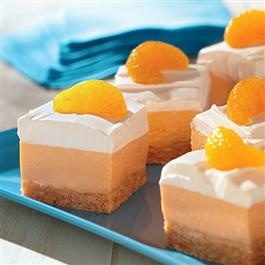 Spread whipped cream evenly over orange filling. Arrange oranges on top of whipped cream. Cut into 24 bars. Chill until ready to serve.